The Ibanez GIO GRG121DX solidbody electric guitar's mahogany body is comfortable and resonant for rockin' all-nighters, while its two humbuckers serve up boatloads of tone. The GRG121DX sports a hardtail bridge that gives you maximum tuning stability, a fast-action maple neck with a flatter-than-Kansas bound New Zealand pine fingerboard, and 24 jumbo frets for the kind of effortless shredding that put Ibanez on the metal map. Cool sharktooth inlays top off the package. 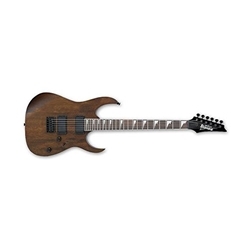 You get a whole lot of guitar for the money with the Ibanez GIO GRG121DX!